Pinnacle’s 150 BBL poly tank is a single piece, roto-molded tank enclosed in a steel cage. There are two 4” full drain flanges molded into the tank. 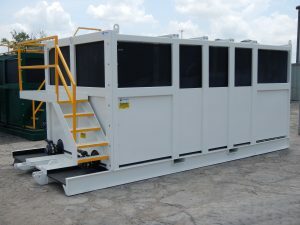 The steel cage has a standard roll-off understructure for easy transport. Various roof top options for manways and connections are available. Contact Pinnacle to learn more!